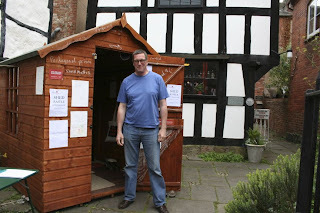 A truly star-studded and brilliant Ledbury Poetry Festival coinciding with National Shed Week. In the midst of some of Britain's best countryside and cider, Ledbury hosted a festival representing every poetic tradition and taste, with performances and readings by Benjamin Zephaniah, Alice Oswald, Ben Okri, John Hartley Williams, Patience Agbabi, Ian Sinclair, Ros Barber, Fred D'Aguiar, Daljit Nagra and August Kleinzahler. August Kleinzahler declared 'We don't have sheds in Brooklyn', but most answers led down a fascinating path of stories, reminiscences and cross-connections. And there were plenty of shed poems by famous and not so famous poets. 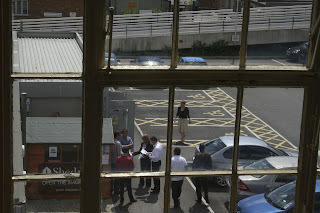 As usual various themes emerged from the shed conversations. Last year it was the river, flows, fluid dynamics and the periphery. This year it was the sea, thoughts of transgender ('the boyhood of girls' - check out the Bisley legend and poems by Angela France and Gregory Award Winner Liz Berry) and fire. Visitors included actress Linda Thorson (The Avengers, Emmerdale), Dame Joan Bakewell (who remembers her Grandfather's fire hazard of a shed at the back of a Manchester terrace) and Roger McGough, who described how his friend with an allotment shed had tried to encourage him in the ways of the soil, but to no avail. 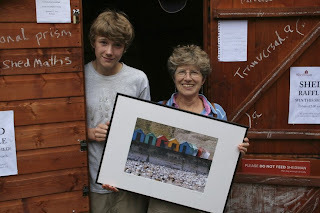 Highlights included the man who came into Shedman's shed and said 'I set fire to my mother', the Engaged Buddhist band The Boddhivistas who sang Shed California to the Eagles tune and Merys, the lovely lady pictured who brought Shedman a miniature homemade shed with a poem inside it. 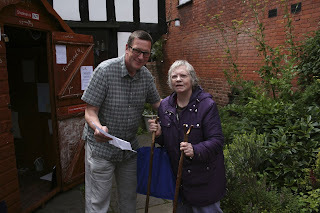 Although very reliant on her sticks she had made the journey from Malvern to Ledbury on her own as she hadn't managed to meet up with Shedman last year. 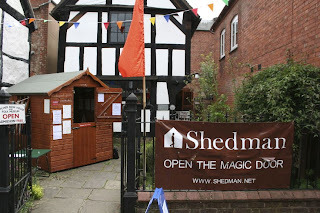 Shedman helped to round off the festival with an hour long Breakfast Shed Show in Ledbury's famous Market Hall, which looks a bit like a half timbered elephant shed. Many of the stories will be posted by Shedman on his website and blogs very soon, but he's very busy on another project - Our Storeys - at North Middlesex University Hospital in Enfield till the end of July. 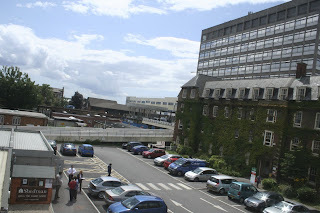 You can meet Shedman outside the Spice of Life Restaurant at the North Middlesex University Hospital on Monday 27th, Wednesday 29th and Thursday 30th July from 10am-4pm and in Emsworth at Havant Literary Festival from 2nd-4th October.